Here at Kyden Machine, we pride ourselves in delivering drafting services to support with product design, quality control, and assembly. Whether it is field verifying dimensions or updating old prints, we have the knowledge and experience to fulfill your drafting needs. 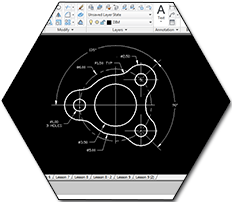 Whether you are looking for simple Auto CAD design or detailed assembly drawings, Kyden has you covered. Let us draft out your next project.